The Ruby layers delicate fringed lace with ivory and pearl-toned hand-beading. Combining dreamy bohemia with the classic Anna Campbell low back and silk bow, the Ruby is styled beautifully with a sparkling roman headpiece and hand-beaded cuff. All Ruby dresses feature a hand beaded ivory and silver embellishment, with lace trim across the shoulders, a 100% Silk Dupion bust, and 100% Silk Satin skirt lining (with the exception of the Summer Silk Chiffon Skirt and Fitted Silk Crepe De Chine Skirt options which feature a power mesh lining). 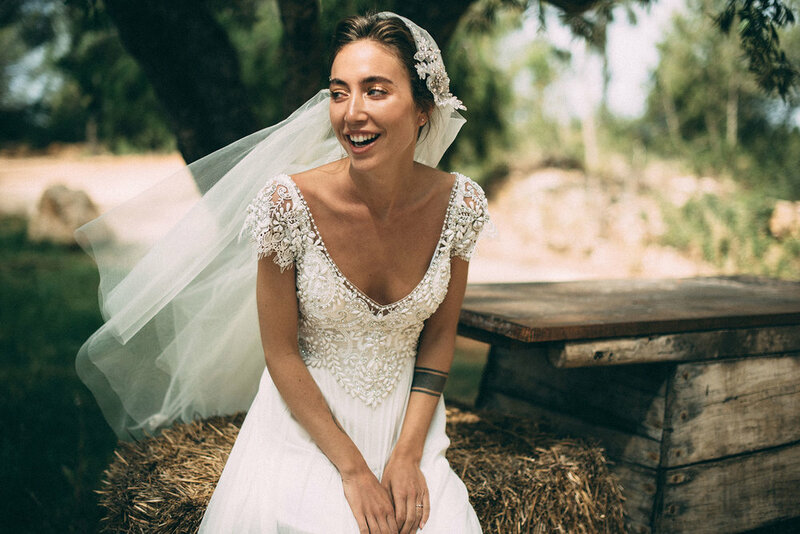 Ruby can be customised with your favourite skirt option: Brocade Silk Chiffon, Fit & Flare Lace, Fitted Silk Crepe de Chine, Silk Organza, Silk Tulle, Slim Line Lace, Slim Line Silk Chiffon, Summer Silk Chiffon and Lace Trumpet. Available in Ivory or Bone (Summer Silk Chiffon and Fitted Silk Crepe de Chine skirt options available in ivory only).